Set out for new, exciting places with an Educational Travel Program that may forever change your outlook on life. We offer unforgettable travel experiences ranging from service learning to language immersion,and team sports to social justice opportunities. All tour itineraries are designed with help from experts in the destination country and structured to provide the most complete, fulfilling, safe, and enjoyable educational experience possible. Sustainability – economic, educational, and/or environmental. The ability to serve the needs of the local community, as determined by the people living there. The chance to work side-by-side with locals. We contribute to economic sustainability wherever we go by staying in locally-owned hotels and eating in locally-owned restaurants. When you return home, whether it is to Warren County or elsewhere, the money spent abroad remains in that community. By contrast, when a typical American travels to the Dominican Republic and stays in a resort, very little money seems to reach the locals. We hire a local transportation company that has a sterling reputation. In addition, we create local jobs by hiring bilingual leaders to facilitate discussions and to be there in case of an emergency. In some cases, we can hire a camp director, laborer, or English teacher from the local population. We put safety first. Our local, bilingual guide and our bus driver stay with us throughout the trip. That means they eat meals with us and board at the same hotel. In the event of an emergency, they know how to get to all of the local hospitals, medical centers, and pharmacies. There is a good way to approach volunteer service – and a bad way. It is important to us to practice ethics when we travel abroad. Before taking our trips, some of our participants choose to start serving the community back home, whether it’s working with Big Brothers and Big Sisters of Chester County or a food pantry in Essex County. They then apply that spirit of service to children in the Dominican Republic or Haiti. We believe in paying fair trade wages and hiring locals where we travel. We also hire locals, so money we bring with us from Burlington County contributes to lasting economic sustainability in the countries we serve. Our educational adventures get rave reviews. 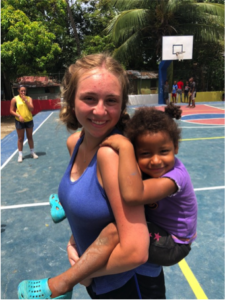 One high school student from Montgomery County, PA, called her Dominican Republic trip “the best week of my life.” In fact, she even signed up for the same trip the following summer. A soccer league from Bucks County and a basketball group from Montgomery County are considering running a sports camp abroad. Universities from Chester County and Bucks County, PA, are running a student trip that provides opportunities for an Educational Travel Program to examine prison reform, women’s issues, poverty, immigration, and more. High school tours from Montgomery County each year participate in a service learning trip, adventures that have proven to be so meaningful that many students have signed up for repeat trips year after year. Find out how an Educational Travel Program available to groups from Burlington County and Essex County, NJ, has students enrolling year after year to experience their tour again. See why college students from Bucks County, Chester County, Burlington County, and Union County, are excited to visit an operational Dominican prison and understand how this country is supporting former inmates in their life after incarceration. Groups from Warren County, Union County, and beyond can contact us about a non-religious mission trip.